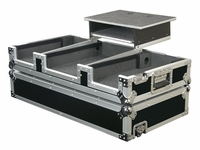 Description: Odyssey Flite Ready Glide Style Coffins holds two medium format tabletop CD players, one 12" mixer and a laptop. 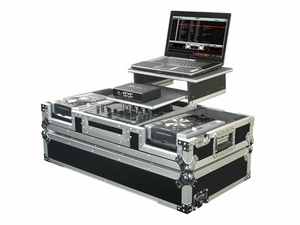 Also features a second shelf specially designed to house a Serato, Torq, hard drive, and many other related items. Features include rugged built-in wheels, heavy duty spring loaded handles and latches, stackable ball corners, and front access panels. Cabling is clean and easy through convenient access ports throughout. Note: Please do not transport your laptop in this case damage may occur.